The southwestern New Hampshire area had previously only advertised tubing for the 2018-19 season. Limited downhill skiing is now being offered at Granite Gorge, as the handle tow on the Bunny Buster trail is now advertised as open. The double chairlift remains closed. Word had emerged in October that downhill skiing may not be offered at Granite Gorge during the 2018-19 season, as its off season Facebook feed was dominated by posts about selling a house and snowmaking pump. At the time, Granite Gorge released a statement that "For this winter, we will primarily be offering snow tubing and cross country skiing" and that "We hope to open ski/ride lifts one at a time as conditions permit." 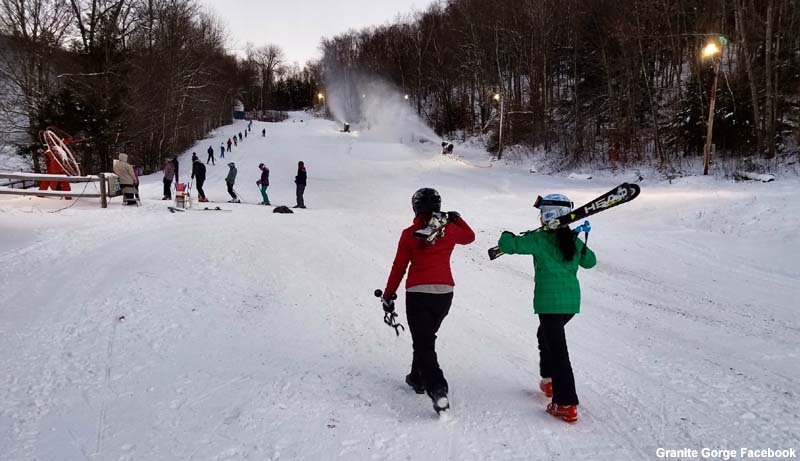 The small novice Glider slope and Magic Carpet reportedly opened on December 22, 2018, while Granite Gorge focused on its snow tubing operation. The handle tow serving the novice Bunny Buster trail reportedly opened this month, restoring ski operations to the pre-2005 Granite Gorge footprint. There is no word as to if or when the Borvig double chairlift, which serves the vast majority of terrain at the 525 vertical foot ski area, will reopen. Located on Route 9 east of Keene, Granite Gorge was opened on the site of the defunct Pinnacle ski area in 2003. A refurbished Borvig double chairlift was installed for the 2005-06 season.